Shreya’s Chronicles | Sheryl Kaleo... var scss_share_image="https://www.sherylkaleo.com/wp-content/uploads/2015/11/Sheryl-Kaleo-Banner-copy-copy.jpg"
DONOR (Shreya’s Chronicles Book 1) can be purchased through Sheryl’s Amazon Author page, Kobo, and Barnes & Noble. 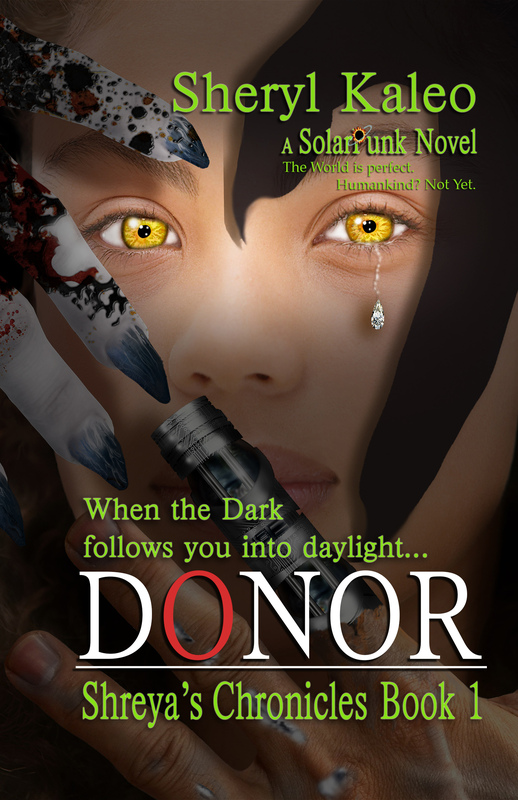 DONOR chronicles Shreya’s journey from an ordinary sixteen-year-old girl living in upstate Louisiana to a fugitive on the run from the law, the unlawful, and those beyond any natural laws known to Humankind. For a peek at the series back cover click blurb. To purchase this and other books by Sheryl Kaleo, please visit her Amazon Author page. Donor is a solarpunk novel where the world is perfect. Humankind? Not yet. In Donor, the world is at the beginning of my Solarpunk time-line. Venice is up in the sky, safe from flooding, but we’re still mostly earthbound with a mix of hovering and land-based vehicles. Most of the world’s ills have been tamed. There’s no pollution, hunger, war, disease—the world is perfect. What’s left to obsess about? Immortality and super-human abilities. In this perfect world, we’re so at odds with our own humanity we don’t want to be human. So we create monsters of ourselves, reflecting our own ugly underbellies, i.e. our neuroses. In Donor I’m exploring the question, what does it mean to be human?